Apple's been keeping quiet about the specs of its new iPhone 3G S, the next-generation device unveiled at Monday's Worldwide Developers Conference. We know all about the iPhone's various features and operating system enhancements, sure, but what's going on under the hood has remained a mystery -- at least, until now. 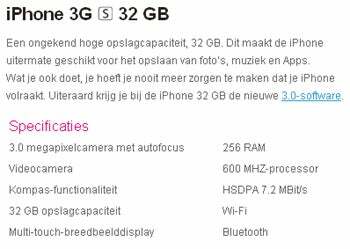 T-Mobile's Netherlands Web site posted a page about the iPhone 3G S that includes detailed information about the device's processor and RAM. The page, initially spotted by the Web-watchers at MacDailyNews was still online as of mid-afternoon Wednesday. The marketing copy isn't written in English, but the specifications require no translation. The iPhone 3G S, according to the T-Mobile site, has 256MB of RAM and a 600MHz processor. Compare that with the current iPhone 3G's 128MB of RAM and 412MHz processor, and Apple's assertion that the iPhone 3G S is twice as fast as its predecessor doesn't seem too far-fetched. To be fair, there's no official Apple confirmation that T-Mobile's specs are correct -- and, given the company's share-no-details stance on specifications, there likely won't be. The numbers do, however, match up exactly with some alleged "insider information" published on a Chinese Apple forum last month.